Hennes & Mauritz AB, a Swedish multinational clothing-retail company, is the second largest global clothing retailer, just behind Inditex. The company has a significant online presence, with online shopping available in 43 countries, COS in 19 countries, Monki and Weekday in 18 countries each, & Other Stories in 13 countries, and Cheap Monday in 5 countries. The company reported SEK 51,229 Million (about US$ 6 billion) of total sales in the Q3 which is 5% more than its previous year . 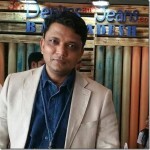 It is also one of the largest retailer of denim apparel globally and the its growth also greatly impacts the denim industry worldwide. In this report , we have done a detailed analysis based on the results published by H&M recently for a period of 9 months from January 2017. • The H&M group’s sales including VAT increased by 7 percent to SEK 173,290 m (approx US$ 20.5 billion) during the first nine months of the financial year . In local currencies sales increased by 4 percent. • Profit after financial items amounted to SEK 15,936 m (approx US$ 1.9 billion) . The group’s profit after tax amounted to SEK 12,191 m (approx US$1.45 billion). The table below shows the sales(In SEK M) for the top ten markets by countries upto nine months for the year 2017 and 2016 including VAT. 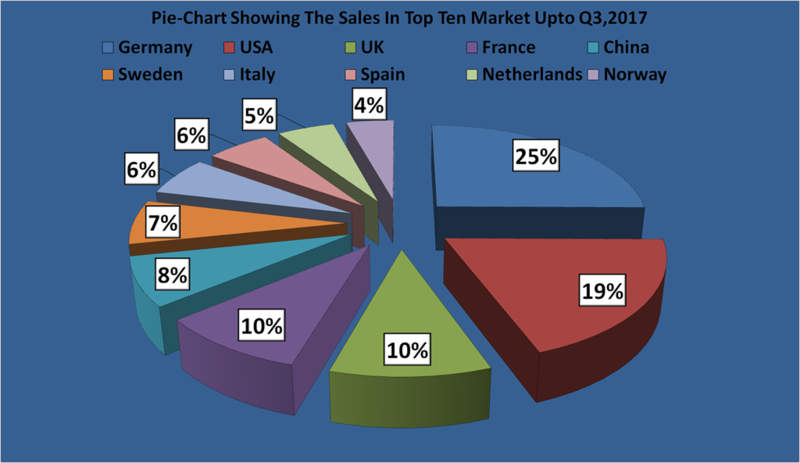 Amongst many countries given in the list below Germany leads the sales upto third quarter of 2017 and 2016. The sales in Germany increased by 2% from SEK 26,877 M in 2016 to SEK 27,310 M in 2017, Similarly the sales for USA increased by 7% from SEK 19,580 M in 2016 to SEK 21,005 M in 2017. UK is the third leading in sales for H & M but the sales decreased by –2% from SEK 11,052 M in 2016 to SEK 10,876 M in 2017. 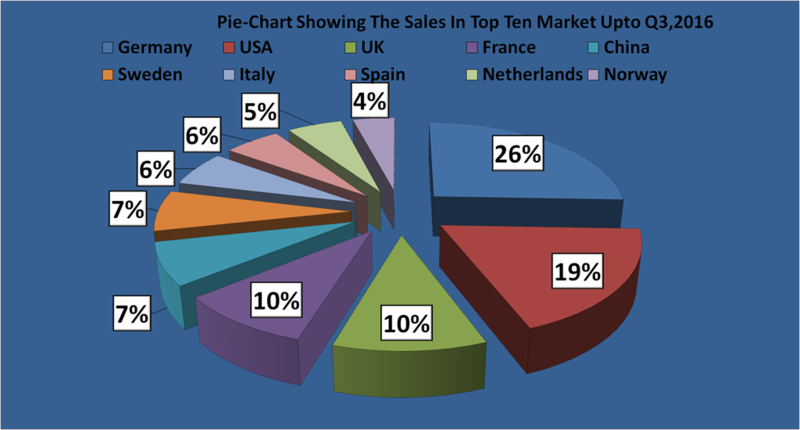 However, the least sales of H&M was in Spain , Netherlands , Norway. The sales for H&M in Spain increased by 5% from , SEK 5840 M in 2016 to SEK 6159 M in 2017, Similarly the sales in Netherlands decreased by –2% from SEK 5,667 M in 2016 to SEK 5,549 M in 2017. 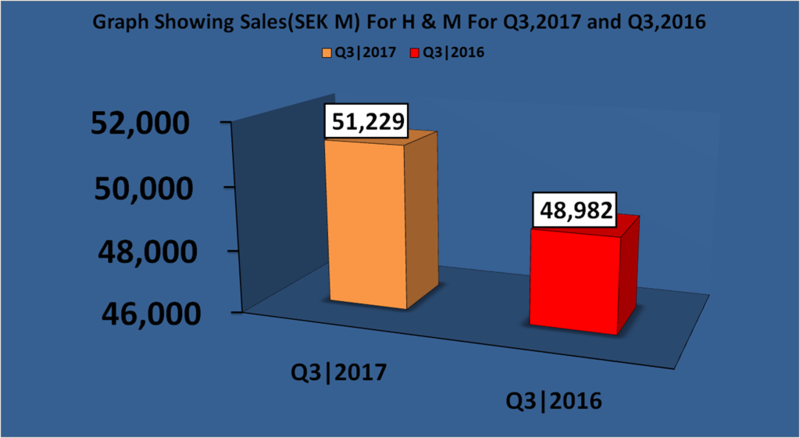 The Sales in Norway saw a positive change of 7% from SEK 4,327 M in 2016 to SEK 4,640 M in 2017. In spring 2017 H&M online stores were opened in further six new markets: Turkey, Taiwan, Hong Kong, Macau, Singapore and Malaysia, all of which have had a good start. The H&M online store is today available in 41 markets and with the addition of Cyprus and the Philippines, which will open later this autumn, the H&M online store will be available in 43 markets by the end of this year. Next year the online expansion will continue into further countries, including India. The plan is to offer e-commerce in the future in all store markets as well as in other markets. New markets for H&M stores in 2017 are Kazakhstan, Colombia, Iceland, Vietnam and Georgia. During the spring the first H&M stores in Kazakhstan and Colombia were opened, and in the third quarter the first store in Reykjavik in Iceland. This was followed by a store opening in Ho Chi Minh City, Vietnam in September. All stores were very well received. For full-year 2017 approximately 475 new physical stores are planned to open, with the focus primarily on growth markets. Most of the new stores in 2017 will be H&M stores, while approximately 70 will consist of the newer brands COS, & Other Stories, Monki, Weekday and ARKET. ARKET got a great reception in August and September on the opening of its first stores in London (Regent Street and Covent Garden), Copenhagen and Brussels, and the launch of its online store in 18 European markets. During the year another opening will take place in Munich. In spring 2018 Stockholm and Amsterdam will get their first ARKET stores. H&M Home will also continue its rapid expansion, with approximately 60 new H&M Home shop-in-shops planned for 2017. The first standalone H&M Home stores are planned to open in 2018. In parallel with the expansion the store portfolio is being optimised through renegotiation, rebuilds and relocations, adjustment of store space and through closures to continually ensure that the store portfolio is right for each market. As a part of this, approximately 90 stores will close, giving a net addition of around 385 new stores for full-year 2017. Uruguay and Ukraine are set to become new H&M store markets in 2018. Below is the details of stores count by brand as on 31-st-August-17 and its comparison with the same period of the last year. The stores count for H&M for 31-st-Aug-16 was 3,784 which increased by 349 stores to 4133 stores as on 31-Aug-17. COS had a stores count of 177 stores in 31-Aug-16 which increased to 38 stores to 215 stores in 31- Aug-17. 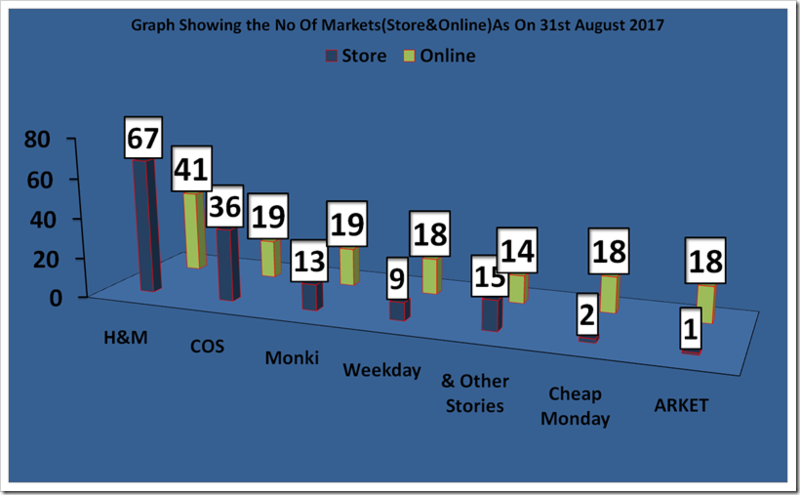 Monki brand had a stores count of 110 as on 31-Aug-16 which increased to 5 stores to 115 stores as on 31-Aug-17. Weekday had a stores count of 23 stores as on 31-Aug-16 which saw a increase in stores by 7 stores to 30 stores as on 31-Aug-17. 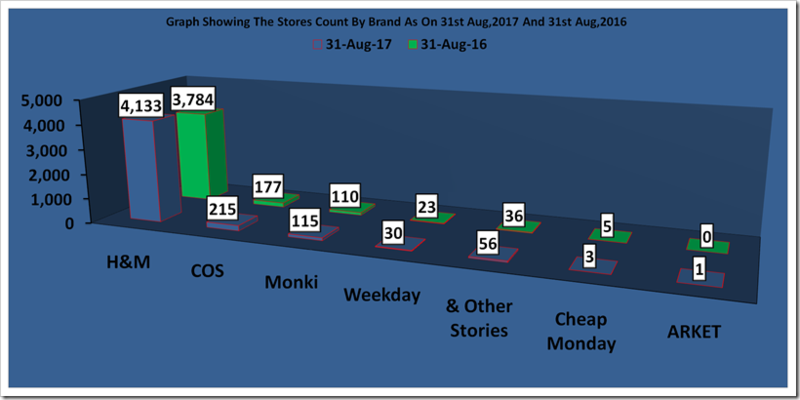 The Brand & other stories had a stores count of 36 stores and the stores number of stores increased to 20 stores to 56 stores As on 31- Aug-17. Cheap Monday had a number of stores 5 which saw an closure of 2 stores as the figure went down to 3 stores as on 31- Aug-17. Arket Brand has 1 stores only as on 31 st- Aug –17. 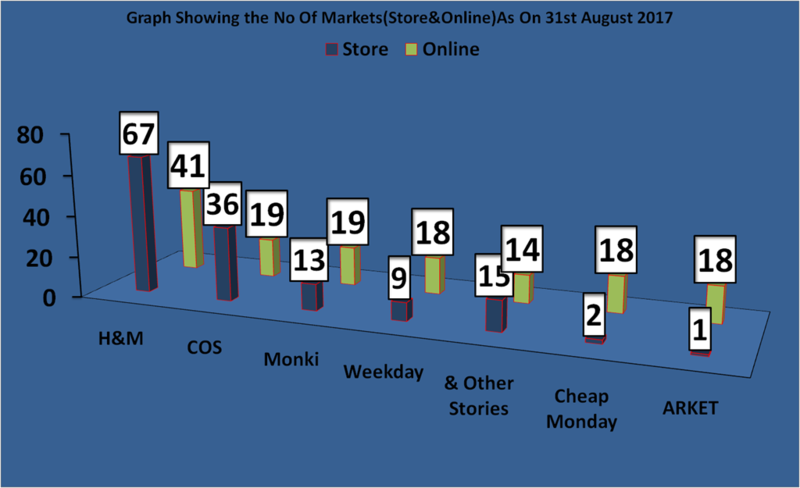 The total stores count by region as on 31st-Aug-17 was 4,553 out of which Europe & Africa had a total count of 2,786 for 31st Aug 2016 and that increased to 138 stores for the 31st Aug 17 to 2,924 stores.The stores Count for Asia & Oceania as on 31-st-Aug –16 was 799 stores which increased to 187 stores to 986 stores in 31-st Aug –17. 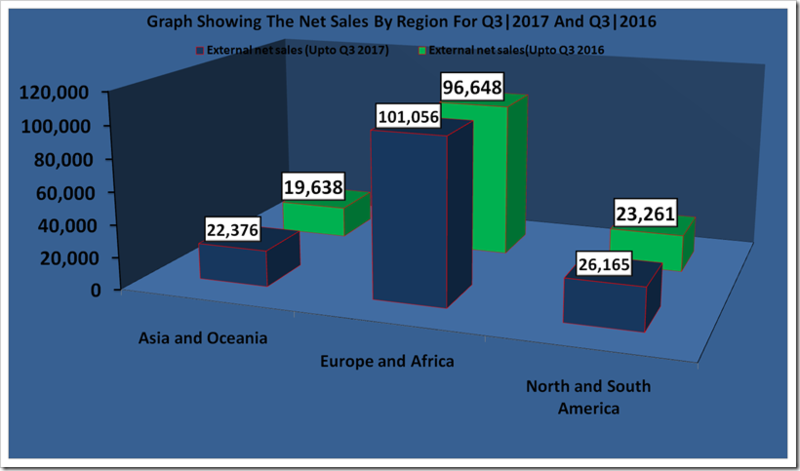 Similar;ly in North & South America region had a total count of 550 stores in 31-aug-16 which increased to 93 stores to 643 stores to 31st – Aug – 17. 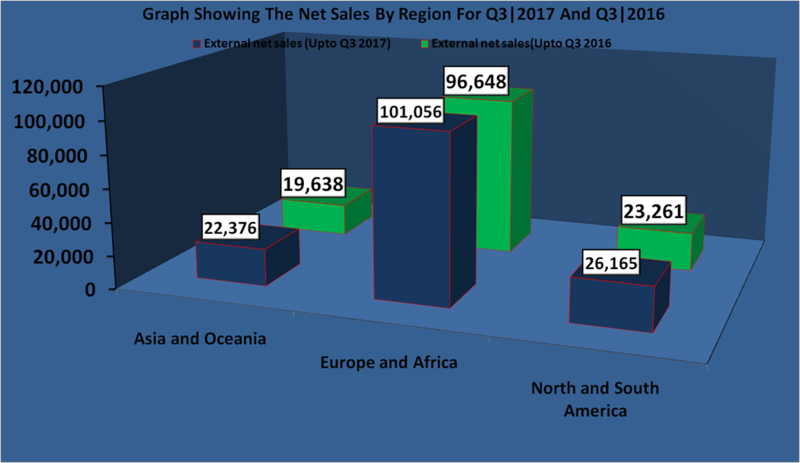 The sales by region shows that the sales for the Asia and Oceania upto Q3 2016 was SEK 19,638 M which increased to about 17 % to SEK 22,376 M , Similarly the sales for Europe and Africa upto Q3 2016 was SEK 96,648 M which saw an increase by about 4%. The sales for North and South America upto Q3 2016 was SEK 23,261M which saw an increase of about 12% to SEK 26,165 M Upto Q3 2017. The Operating profit for Asia and Oceania upto Q3 2016 was SEK 318 M which increased to 27 % to SEK 403 M upto Q3 2017. 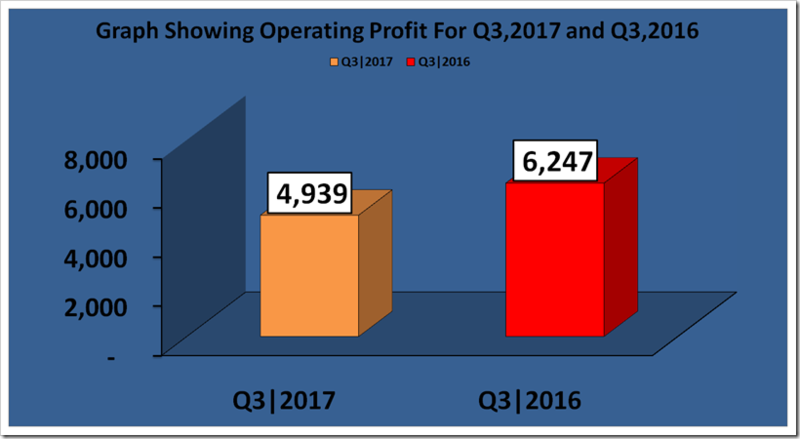 Similar;ly the profit for Europe and Africa upto Q3 2016 was SEK 447 M which increased about 39% to SEK 662 M upto Q3 2017. 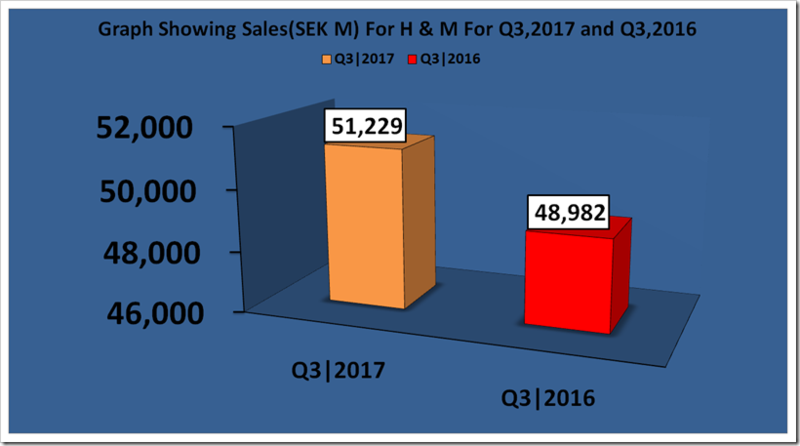 The Operating profit for North and South America Upto Q3,2016 was SEK 643 M which decreased about 119% to –127 SEKupto Q3 2017 M.
The sales for H&M in third quarter 2017 saw an increase of about 5% from SEK 48,982 M in Q3,2016 to SEK 51,229 M in Q3,2017. 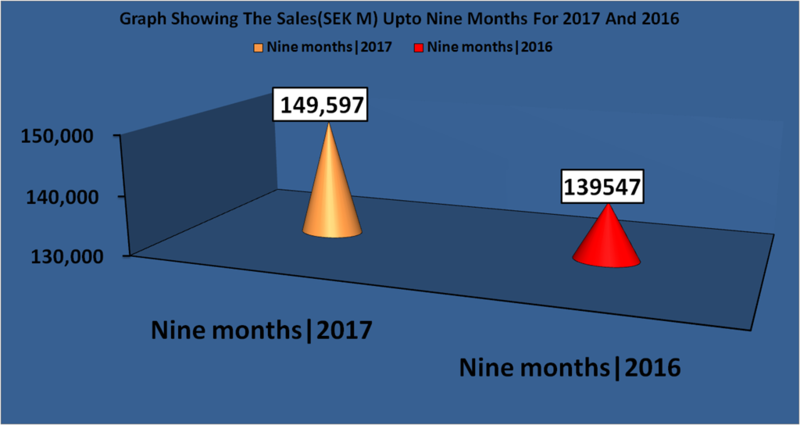 Similarly the sales figure for the first nine months of 2017 saw an increase of about 7% from SEK 13,9547 M in nine months, 2016 to SEK 149,597 M in nine months, 2017. 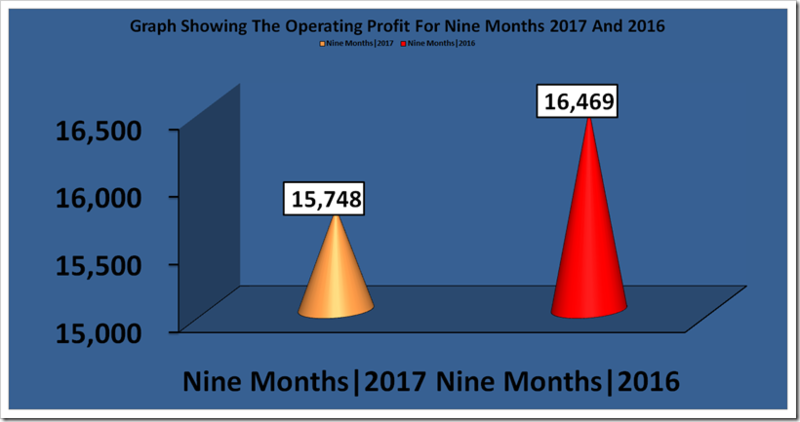 Further analysis shows that although there is an increase of sales for both the period but the operating profit is reducing for both the period . 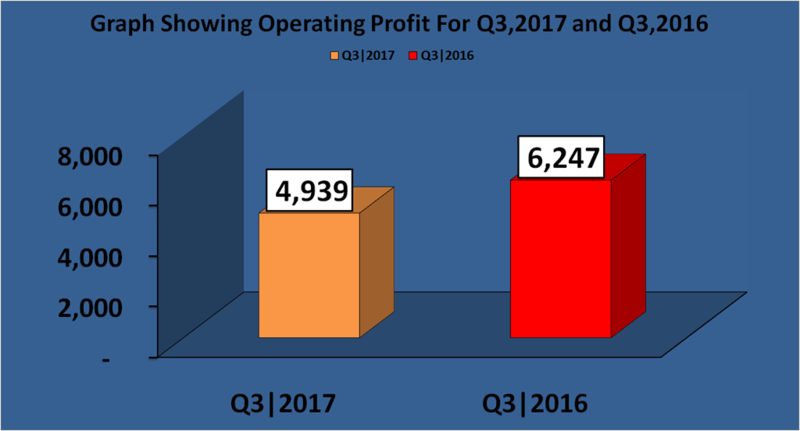 The operating profit for third quarter 2017 saw a decrease of about 20% from SEK 6247 M in Q3, 2016 to SEK 4939 M In Q3, 2017. 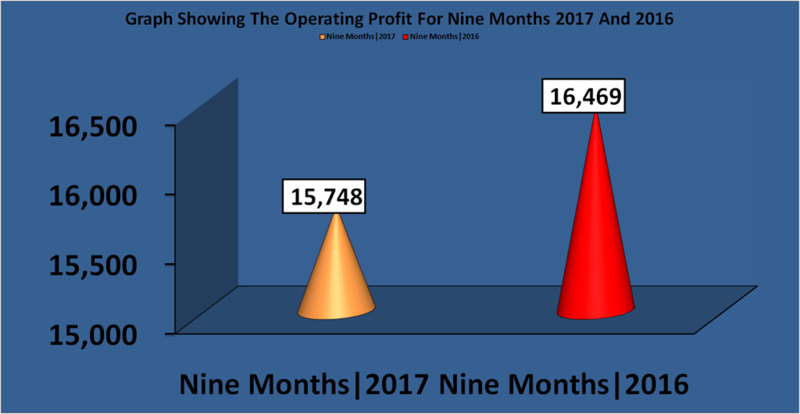 Similarly , the operating profit for the nine months, 2017 saw an decrease of about 4.5 % from SEK 16,469 M in Nine months, 2016 to SEK 15,748 M in nine months, 2017. 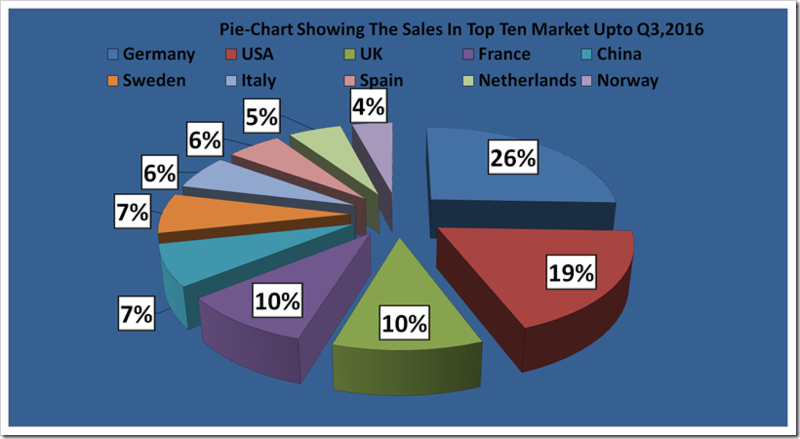 This can happen due to reduction in price and increase in sales volume.